Independent Councillors Roger Giles and Claire Wright will be commenting on the present controversies in East Devon. They will discuss the impact of the National Planning Policy Framework deadline (scheduled for Wednesday 27th March), dubbed Black Wednesday for the Countryside. 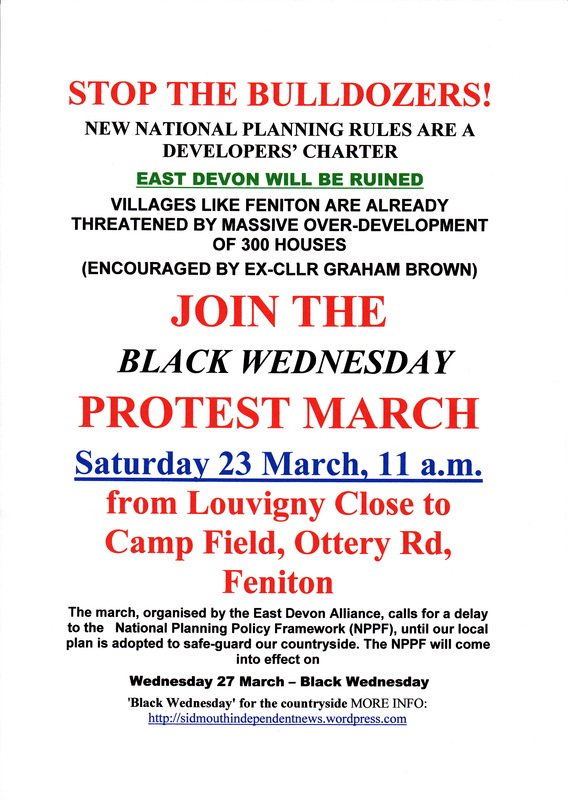 Large crowds are expected at the Countdown to Black Wednesday protest march next Saturday (23/03) , at Feniton , a village under threat from developers. Graham Brown, the disgraced ex-Chair of the East Devon Business Forum, was formerly the Councillor for Feniton and Buckerell.